Relax on the beach while keeping your eyes peeled for the Triple Toucan. Click here to play! In this paradise adventure, you'll need to do little more than look to the turquoise skies for a chance to win a beach bag full of money! Grab some binoculars while sipping coconut milk on the beaches for a chance to find the fantastic Toucan. This colorful bird acts as a substitute symbol, which means that it will replace any other symbol except scatters to create a winning combination. It will also triple prizes when it appears in a winning combo. If you can't spot him, don't worry because Parrots also frequent these skies. Two or more of these birds will get you up to 3000 times your original line bet. Add to that tree frogs, flowers and coconuts, each paying out up to 1000 or 500 times your original line bet respectively, and you'll be sure to collect a small fortune in no time. 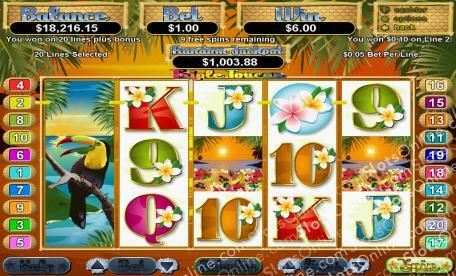 If you find two or more tropical fruit icons, you'll get up to 300 times your total bet. Not only that, but three or more anywhere on the board and you'll trigger a feature that will reward you with up to 25 free games in which the Toucan will expand to cover an entire reel. So scour the tropical skies for a chance at a nest full of cash! The tropical fruit acts as the scatter in this game. Two or more will mulitply your total bet up to 300 times. Three anywhere on the board will trigger a free game feature that could see you getting up to 25 free spins! The toucan will expand across an entire reel if they appear during the free spins to help you triple your prize money. The colorful toucan acts as a substitute. He will replace all other symbols, excluding scatters, to create more winning combinations. He will also triple prize money when he appears in a winning combo.